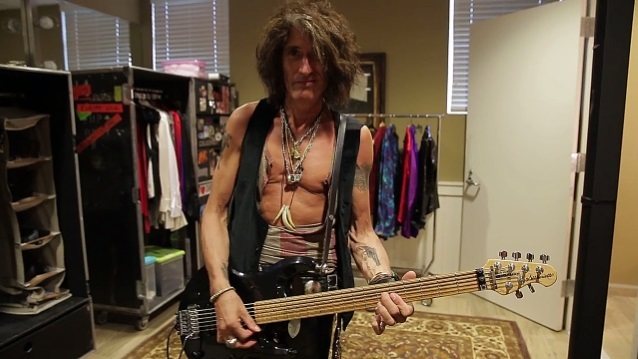 AEROSMITH's Joe Perry has just released his first holiday collection with the download-only EP "Joe Perry's Merry Christmas". The new set features four Christmas classics: "White Christmas", "Silent Night", "Santa Claus Is Back In Town" and "Run Run Rudolph" with Johnny Depp on rhythm guitar. Perry told Guitar International about his friendship with Depp and the actor's contribution to the EP: "I've been a fan of his acting for a long time. I remember seeing him in the movie 'Chocolat', where he plays the gypsy guitar player. I was really impressed. You could tell that he was really playing guitar versus cutting back and forth to a musician. In the movie, he plays a lot of Django Reinhardt stuff. I didn't know him at the time, but remember telling myself that someday I have to get a guitar lesson off him if I meet him since I don't know any of that type of stuff. As it turned out, about four years later he dropped by the studio when AEROSMITH recorded our last studio record with [producer] Jack Douglas. Jack knew him and asked him to come down. We started talking music and guitars and that's where our friendship started." He continued: "When AEROSMITH came back from South America, I didn't have any of studio guitars and needed a nice acoustic to play on the CD so asked him I could borrow one. He took me to his studio where he had 20 or 25 vintage Martins from 1933 and old blues-style guitars — one of the nicest collections I've seen. He lent me one and I asked him to sing background vocals on 'Freedom Fighter'." "I've been out here in a L.A. for a while now since the book tour ended and he said I could use his studio, so I have been working on some solo stuff in my spare time with what little I have. Perry added: "I've always wanted to do a Christmas CD with AEROSMITH; it's one of those short-list things that we never got around to doing, like a blues CD or a cover CD of rock songs. "I had some time and decided to cover a few Christmas songs for an EP and put it out on iTunes. They turned out lot better than I thought they would. Johnny came by to listen and we were planning to do 'Run Run Rudolph', as we are both big Chuck Berry fans. It was the perfect chance to have him lay a rhythm track down alongside mine. It worked great as we were both 'Chuck Berrying-out.'" Perry told The Pulse Of Radio that for his upcoming solo album, he'll again be heading down the instrumental route for a few of the tunes. "I've written a bunch of stuff and it's probably focused a little more on some instrumental stuff," he said. "I was nominated for a Grammy for one of the songs on the 'Joe Perry' solo record, and I've always had a couple of instrumental things on there, so, I'm thinkin' of goin' a little bit down that road. I've been inspired in a way that I haven't been inspired for the other records and it's coming from a different place. And that, probably wouldn't. . . I probably wouldn't put that out anyway 'till early [in 2015]."